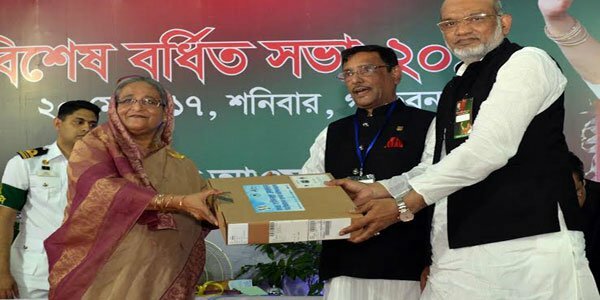 Prime Minister Sheikh Hasina launched the programme by handing over laptops to representatives of eight divisional party offices after a meeting of the party at Ganabhaban. Hasina, also the party chief, earlier announced her vision 2021 to see digital Bangladesh by that time. “This initiative has been taken to make the leaders and workers skilled in information technology,” said AL Forest and Environment Affairs Secretary Delwar Hossain. “It will help spearhead campaigns for the next general election in favour of the party across the country,” the AL leader was quoted to have said by state-run Bangladesh Sangband Sangstha news agency. Leaders of district units of the party have been asked to collect laptops for their respective offices from Awami League president’s Dhanmondi political office.